In a past life, before I came to China, I had a cook's dream kitchen. Vast expanses of stainless steel benchtops, loads of cupboards, twin ovens and two large sinks. What I see here every day though, is marvellous, delicious food produced from the smallest imaginable preparation space, consisting of a sink (or sometimes just a plastic tub full of water), a chopping board (often blanced on top of the sink) and a single portable wok burner - either conventional electric or induction. There is isually also a rice cooker plugged in somewhere which can do double-time as a hot-pot and soup cooker. 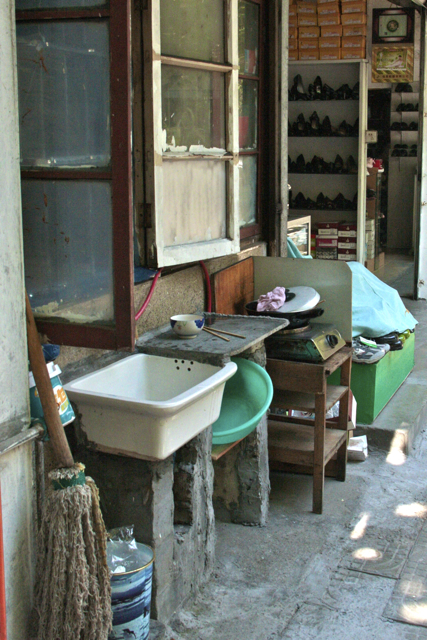 The set-up in the photo is typical, and when your kitchen is this small it can be set up anywhere - outside your house on the street, at the back of your shop (I had one of my best meals cooked in the back of an indoor plant shop) or in your stairwell (in Shanghai, large houses were divided into multiple apartments during the Cultural Revolution, and with only one existing kitchen, all the new tenants needed somewhere to cook - usually the main stairwell). It makes me wonder what on earth I thought I needed all that space for. What a great invention the cleaver is! It sits so well-balanced in the hand that you can perform delicate tasks like peeling ginger, or heavy jobs like chopping roast duck. The broad flat blade is great for crushing garlic and nuts too. The only job it's not much good at is slicing bread. A single pan for frying, braising, boiling, steaming, smoking or deep-frying. The majority of woks now come with flat bases to make them suitable for induction hotplates (safer too). I've made bolognaise, curry, paella and pasta in mine. It's big, it's deep, it's great. Soy sauce, oil, dark vinegar, oyster sauce and rice wine, plus salt, sugar, and white pepper will see you through hundreds if not thousands of different Chinese dishes. Used in different combinations and ratios they are the basics every cook keeps in a little tray next to the wok. Now this is open to interpretation, and edible in one man's book is inedible in another. But did I think duck tongues or jellyfish could be delicious? No! Are they? You bet! We could learn a lot from a food culture where absolutely nothing is wasted. When I bought the duck for last week's Project Food Blog Challenge, I was given the liver and heart in one bag, and the feet and head in another. I've yet to learn what I was supposed to do with these, but rest assured they would have been cooked in some delicious way and eaten with gusto. I'll leave you with a picture of the duck tongues. 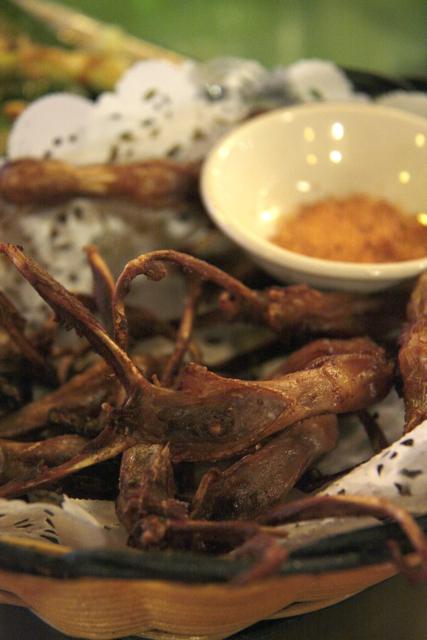 They're really more like duck mandibles with the lower bill attached, and the deal is, you dip them in the spiced salt, then gnaw the tiny bits of meat off the bones. It's all about the gnawing really.